gingertom wrote: Fines don't pay anybodies wages. Utter rubbish!!! Have a look at the link below. Are your comments directed at me ? I have no idea what you are on about, who suggested fines pay wages ? utter rubbish indeed. I was merely stating that fines don't pay wages or keep the legal system operational.Nor does the imposition of such keep the actors within legal system in salaries.The hugely important issue is that these fines displace the presumption of innocence.Its Conviction without a chance to defend offered to the offender, so no need for representation by a practitioner and therefore no fees for representing. Maybe contributors would be interested in the article which gives current information on salaries for legal practitioners in Ireland. No secrets there on page 17. You quoted me, hence my question .... who suggested fines pay wages?. I merely copied your post Toss. gingertom Thanks for posting that link to the Gazette. I read an interesting bit on septic tanks. We have one and I had forgotten that the registration was for five years. I double checked and it ended September 2017. I followed the link in the article and got confirmation that we did not need to re register. I never would have checked if you hadn't posted that gazette!!! You are very welcome Rocker. I believe that access to the law is of paramount importance for the law to work. Historically practitioners have secreted all aspects of how to use the law for all as an asset to garner income. Time for change for sure. I spent most of my youth and adult life fighting for woman's rights and some type of equality for working women. I am now resting, retired and thinking that today's women will have a much better look in than we did!! Ha, silly me. I got in the post yesterday some forms which had to be completed and taken to a Social Welfare office with 1.Identification, 2. Utility bill, 3,photos. As we all know these outdated forms look for a utility bills when nowadays all or most of us pay on line and don't receive bills for utilities. Banking is done on line and most other transactions are confirmed by e mail. I arrived at the office and explained to the young fellow behind the desk that my husband dealt with all utility payments and banking and that I didn't have any paper with my name on it to prove I lived at the address stated....Do you know what this chap said ...to me ...who has campaigned over 60 years for women!!!!! "well (and I think he may have said my dear) this happens a lot and what you need to do is get your husband to give you a utility bill and a note stating that he confirms that you live at this address also".....RED RAGto the feminist, flag waving auld wan......I told him I couldn't believe that a young man in the 21st Century still thought like the cave men of my youth!!!!!!! when a woman could not get a bank loan except in her husband's name etc.....your man in the office is still looking at me!!!! Eventually my Public Services Card proved sufficient!! !...but the mindset still exists!!!!!!!!! That type of carry-on wouldn't happen if there was a woman in charge! I'm going to write a strongly worded letter to the current and former incumbents . . .
Regina Doherty . . doh! Joan Burton . . . doh! Mary Hannifin . . . doh! Micheál wrote: That type of carry-on wouldn't happen if there was a woman in charge! Oh Michéal... you divil...but, at least you know the names of the incumbents!!! more than can be said of meself!! I confess I overlooked Saint Leo. Easy money ..... and why not ? the state has opened the doors for them to help themselves.... charging you for disposal and then selling your waste on for profit, fair play to them, we are the gobshites. Toss wrote: charging you for disposal and then selling your waste on for profit, fair play to them, we are the gobshites. Ha Toss. rubbish, what a no brainer that one. Charge you for the bins, charge you for collection, and as you say, sell it, and then they in turn sell it on. Some buisness that. I said before if everybody refused to give away their rubbish until THEY pay YOU for it things might change. Even just glass, tin and aluminium. How much would a compressed 4ft x 4ft block of aluminium be worth to breweries? I was "down the country" today and I can tell you that not everyone is putting their waste in bins. I couldn't believe just how much plastic wrapping is along the roads and in the fields. On the main motorways there are old tyres, bits of bumpers, even bits of couch. I don't think anyone cares where they dump their rubbish. I also encountered five road kills which looked like they have been there for days. With all these roads authorities and councils not one of them seems to have responsibility to send out the man with the brush!! Oh and potholes ...blink and you are in one on the smaller, narrower roads with no where to dodge them!! and everyone is buzzing along at about 200 an hour and no one enforcing the 80 speed limit!! You need courage to travel the M50 etc!...now, this is the Moan topic isn't it!!! Rocker wrote: I was "down the country" today and I can tell you that not everyone is putting their waste in bins. I couldn't believe just how much plastic wrapping is along the roads and in the fields. 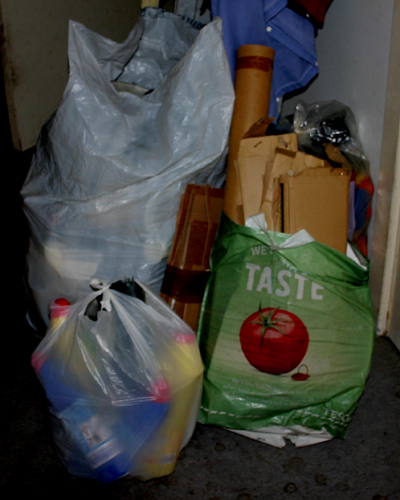 Being the good citizen I am here's my plastic, paper and cardboard heading for the share bins later today, and on the way a stop off at power city to throw away some electrical stuff. Tins and bottles, second-hand clothes and shoes banks I dump just around the corner. Easy for me to say though living alone, just saying there are alternative ways to get rid of it without dumping it. This is about six months of plastic. Rocker wrote: I was "down the country" today and I can tell you that not everyone is putting their waste in bins. I couldn't believe just how much plastic wrapping is along the roads and in the fields. On the main motorways there are old tyres, bits of bumpers, even bits of couch. I don't think anyone cares where they dump their rubbish. I also encountered five road kills which looked like they have been there for days. With all these roads authorities and councils not one of them seems to have responsibility to send out the man with the brush!! Oh and potholes ...blink and you are in one on the smaller, narrower roads with no where to dodge them!! and everyone is buzzing along at about 200 an hour and no one enforcing the 80 speed limit!! You need courage to travel the M50 etc!...now, this is the Moan topic isn't it!!! hahahaha ah now rocker, do you not know that there are no men with brushes anymore ...... unless its the tidy towns people or local residents assocation (RA) out doing the councils work for them. I was asked by our local 'RA' to help them spring clean the area a few weeks ago, I politely declined but this woman got very irate and started getting lippy about how people like me should be ashamed. Wrong place, wrong time ..... I gave as good as I got, explaining that I pay tax on everything and that our road tax, house tax and every other tax is not being used to meet the needs of our area. So having paid without choice, why should I go out and do the councils work for them ?. I suggested that I would be more than happy to join in with her and her group if they wished to go down and complain to the DLRCC about the need to spend more of our money on road / estate maintenance programmes and less on themselves and their creature comforts. A debate ensued and three of the five people with her actually agreed I had a point .... she then turned on them and was left standing with one man (whom I suspect was her husband) as they went home. It turns out she is a FG wannabe who bullies her weak neighbours into making her look good when she reports back on her area ..... I guess she will not be calling back. There's still a huge competitive market there for businesses to get rid of our crap. It's piling up. I just can't believe how people think they can just leave their rubbish for someone else to clean up. I was in the hospital today and in the very nice coffee shop there wasn't a clear table. The lunchtime crowd had eaten their stuff, drunk their coffee and hadn't cleared their stuff into the bins and receptacles. Many had taken in newspapers to read and just left them on the seats!! I'm all right jack! !Back home on the DART where the home going (children) I thought of them as brats!! were eating crisps, drinking soft drinks and spilling more than they were drinking. Again each alighted at their stop and left the detritus on the seats !! Hope the "mountain side" division liaise with the "hose down the DART" rubbish division. and we haven't started yet!!!! I could moan for Ireland!! I heard a very interesting documentary on Newstalk this morning about the demise of Irish apples. Supermarkets are demandin hard unripe apples from far away countries and not trying to source Irish apples which wont keep as well on their shelves. The Irish seed savers ssociation is trying to keep Irish apple types growing and I found this article on good irish apples....worth looking for!! Here are five Irish apples I have selected from the Irish Seed Savers Association list. These are varieties I can recommend and are just a few from the heritage collection you might like to try. 1 Ard Cairn Russet (Cork) Dessert -- October/November -- Yellowish white flesh, dry, firm and sweet. Medium sized, conical fruit, golden yellow skin often flushed with carmine. Almost entirely covered with thick golden brown russet. Keeps well into January. Found in a garden in Ireland in 1890. Once found in orchards throughout the country. Listed in Hartland of Cork's catalogue of 1907. Received a Royal Horticultural Society Award of Merit of 1910. 2 Irish Peach (Sligo) Dessert -- end August -- Small, round, slightly flattened angular fruit. Smooth, pale-yellow skin with brownish-red flush. Slight stripes of darker carmine red and with slight greyish russet specks. Dr Lamb describes it as "the most delicious fruit of its season, but like all early varieties it should be fully ripened on the tree, and eaten soon after gathering". It is quite likely that the Irish Peach originated in Co Sligo. It was held in great esteem during the 1800s and was exported to England, where it is still available today. 3 Kerry Pippin (Kerry) Dessert -- August -- Hard, crisp white flesh with a spicy tang. Small and oval, flattened at eye end. Skin orange-yellow with dull carmine flush and stippling. Often with pearly white dots and sometimes a few slight russet patches. A small apple but very good for the small garden. Fruits are crisp and crunchy and the tree a regular bearer. Long grown in Ireland. Mentioned in the Statistical Surveys of the RDS in counties Kilkenny and Antrim in 1802 and 1812. 4 Lady's Finger of Offaly (Offaly) Dessert -- October -- Firm, sweet, greenish-white flesh. Medium sized, markedly oblong fruit. Lady's Finger is the name commonly applied to any long shaped apple. Generally not scabby. Seen in counties Offaly, Monaghan and Dublin. 5 Kilkenny Pearmain (Kilkenny) Dual -- October/November -- Sweet, crisp flesh, mild flavour. Medium sized green fruit with red flush. Very vigorous variety. Recorded in Ireland in 1831. Fruit holds well on the tree. All very true Rocker ..... and its an ongoing scenario with other core fruit and vegetables. Our politicians have willingly allowed our indigenous food supply be shut down as they failed to control imports. Years of paying farmers subsidies and offering them huge incentives to change their business plans has resulted in a very limited output and a total lack of forward thinking. The recent smear test debacle yet again shows up the stupidity and folly of globalisation .... sadly its in every aspect of our lives now. We have sold our soul in terms of self sufficiency ..... there's very little left here that's 100% Irish. Is there Tax payable on these particular Irish Apples?